Texas Tech University Health Sciences Center El Paso’s (TTUHSC El Paso) 2016-17 Student Government Association (SGA) president has a huge task ahead of him. Up until April 2016, the SGA president had served solely as a spokesperson for medical students. 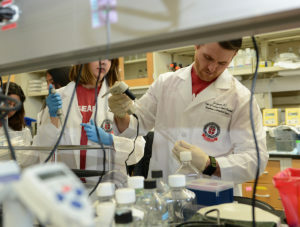 But as the campus continues to grow — now home to both nursing and biomedical sciences students — the SGA decided to expand its representation. For the first time in university history, the SGA president will represent the entire campus – not just the Paul L. Foster School of Medicine (PLFSOM). 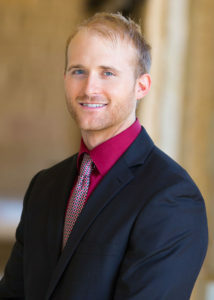 First to take on this expanded presidential role is Eric Vest, a master’s student in the Graduate School of Biomedical Sciences (GSBS). Tech View chatted with Vest to learn more about him and his plans for the upcoming 2016-17 school year. After earning my master’s, I hope to stay here for medical school. Right now, I’m passionate about cardiology, but I’m also a big proponent of preventative medicine. For example, diabetes is a prominent issue here in El Paso. But what causes diabetes? A lot of it is brought on by the foods we eat and the culture we live in. Q: Are you participating in any research here at TTUHSC El Paso? I’m working with Haoquan Wu, Ph.D., right now on CRISPR, a promising technique that will one day allow scientists to modify genes to cure diseases. We’re trying to improve the technique so that it can become a more effective lab tool. Q: What’s something that people would be surprised to know about you? I’m a competitive break dancer; I know how to do windmills and flares. I also have met Jack Nicholas, Steven King and Jim Carrey. My dad used to be a professional chef and I would travel with him around the country to cater for celebrity parties. Q: As SGA president, what are some of your goals for the school year? I started representing TTUHSC El Paso at the Board of Regents meetings this month. I want to help our campus stand out as much as possible. I’d like to try to get our school more funding and for the SGA to get more involved with the community. Since this is the first year SGA has been established [campuswide], I want to set the organization up with a strong foundation so that future presidents and officers can build on it. Q: What’s your message to stude nts at TTUHSC El Paso? My main priority is not to show favoritism to any particular school. We’re all getting ready for the start of the school year and I’m here to represent everyone. I want people to get to know me; I want people to know that they can come to me with their questions and concerns. Q: What do you love about TTUHSC El Paso? I don’t feel like another number here. It’s very intimate. There are only 14 people in my class and I love that!